Quick overview A leading text in the field of social work skills and methods, illustrating how these two are linked, with a grounding in theory. "What a sensible book, a book born of much wisdom and practical experience. Pamela Trevithick takes the reader on a wonderfully clear but thorough journey of social work's knowledge, skills and values in which theories are elegantly put into practice. The whole enterprise is reassuringly held together by a strong commitment to organised thinking and the value of the social work relationship. For those who want to sharpen their ideas while keeping their practical feet firmly on the ground, this is the book for you." Professor David Howe, University of East Anglia, UK "This new edition is an excellent resource for practitioners, students and indeed managers in social work and social care who are committed to effective practice and service delivery ...Trevithick provides a comprehensive knowledge and skills framework and excellent practice examples to enable the reader to apply the knowledge to undertaking skilled and effective practice. This is a clear, readily understandable and comprehensive text which also integrates the complexity of practising social work. I highly recommend it." Professor Joyce Lishman, recently retired as Head of School of Applied Social Studies, Robert Gordon University, UK "A fantastic guide to social work practice and one I would recommend for the bookshelf of any social work student. It has a user friendly style that presents issues in an accessible way." 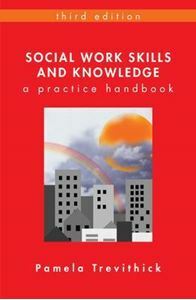 Kate Grant, Social Work Student, University of Bristol, UK "A brilliant MUST BUY book for all social workers. It covers an amazing range of issues which are easy to find using the index. I will use it constantly throughout my career." Amanda Moorcroft, Social Work Practitioner, UK Since its first publication in 2000, this best-selling text has been an invaluable resource for thousands of social workers preparing for life in practice. Written by an influential academic-practitioner, it is widely regarded as the leading book in its field. The third edition has been thoroughly updated to include sections on theoretical, factual and practice knowledge. Key features include: 4 new chapters that integrate theory and practice in a Knowledge and Skills Framework or 'map' of professional practice 80 social work skills and interventions 12 appendices describing a range of different social work approaches A wide range of practice examples linking theory and practiceSocial Work Skills is essential reading for all social work students and a valuable reference tool for practising social workers, social services managers and human service professionals.